"It is not birth, marriage, or death, but gastrulation, which is truly the most important time in your life." During gastrulation, cell movements result in a massive reorganization of the embryo from a simple spherical ball of cells, the blastula, into a multi-layered organism. 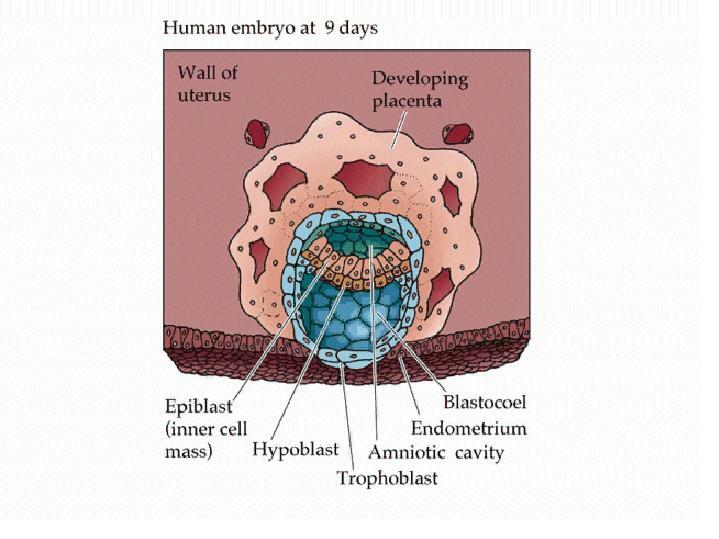 During gastrulation, many of the cells at or near the surface of the embryo move to a new, more interior location. The primary germ layers (endoderm, mesoderm, and ectoderm) are formed and organized in their proper locations during gastrulation. Endoderm, the most internal germ layer, forms the lining of the gut and other internal organs. Ectoderm, the most exterior germ layer, forms skin, brain, the nervous system, and other external tissues. Mesoderm, the the middle germ layer, forms muscle, the skeletal system, and the circulatory system. 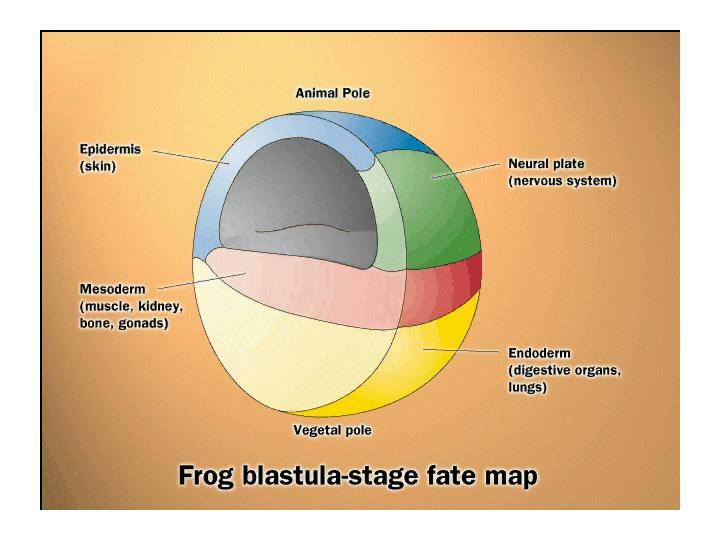 This fate map diagram of a Xenopus blastula shows cells whose fate is to become ectoderm in blue and green, cells whose fate is to become mesoderm in red, and cells whose fate is to become endoderm in yellow. Notice that the cells that will become endoderm are NOT internal! Although the details of gastrulation differ between various groups of animals, the cellular mechanisms involved in gastrulation are common to all animals. Gastrulation involves changes in cell motility, cell shape, and cell adhesion. 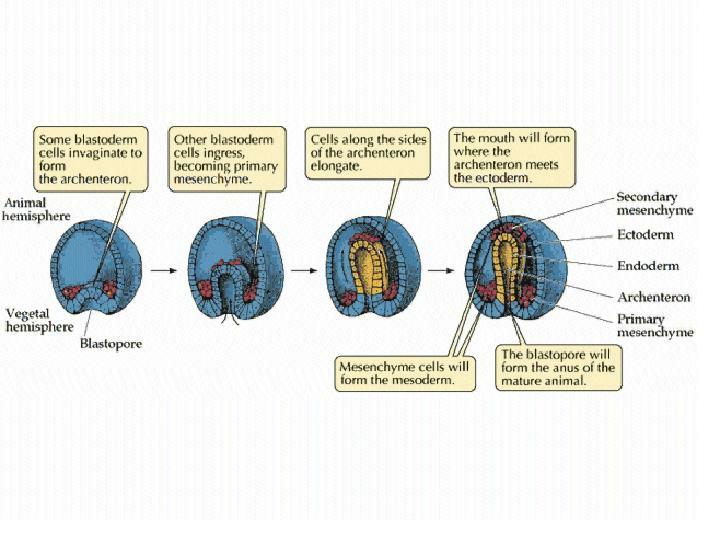 Below are schematic diagrams of the major types of cell movements that occur during gastrulation. Invagination: a sheet of cells (called an epithelial sheet) bends inward. Ingression: individual cells leave an epithelial sheet and become freely migrating mesenchyme cells. 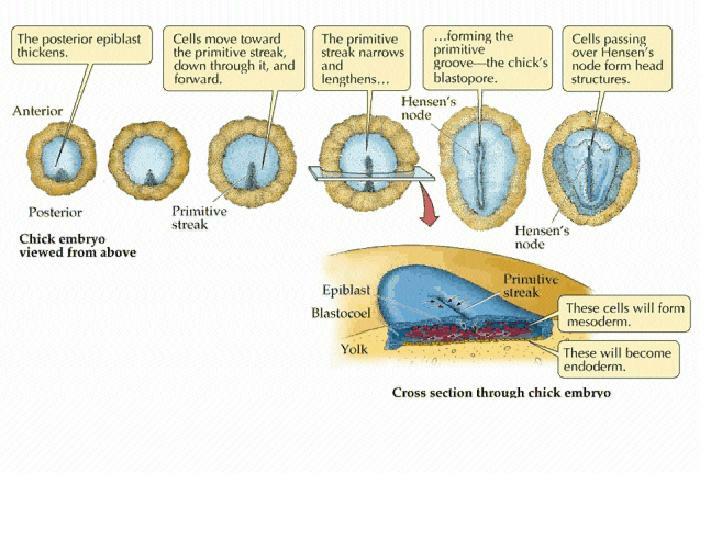 Involution: an epithelial sheet rolls inward to form an underlying layer. Epiboly: a sheet of cells spreads by thinning. Intercalation: rows of cells move between one another, creating an array of cells that is longer (in one or more dimensions) but thinner. Convergent Extension: rows of cells intercalate, but the intercalation is highly directional. 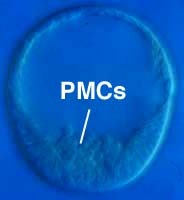 Primary mesenchyme cells undergo ingression at the onset of gastrulation, in part due to changes in their cell-adhesion properties. The vegetal plate undergoes primary invagination to produce the archenteron (primitive gut). Primary invagination is thought to result from changes in the shape of cells in the vegetal plate. 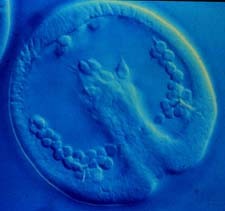 Secondary invagination involves the elongation of the archenteron across the blastocoel, where it attaches near the animal pole of the embryo. Secondary invagination is thought to involve filapodia extended by the secondary mesenchyme cells located at the tip of the archenteron. This high magnification view shows a filopodium extended by a secondary mesenchyme cell. Secondary invagination also involves convergent extension. These images show the rearrangement of a labelled clone of cells during archenteron elongation. In the image on the left, the clone of labelled cells has smooth boundaries; by the end of gastrulation, shown on the right, the labelled cells have intercalated with neighboring unlabeled cells to generate a jagged boundary. This movie was constructed from a series of cross-sectional images taken by confocal microscopy during Xenopus gastrulation. The animal pole is up, and dorsal is to the right. Use the control panel to move through the image in order to see all of cell migrations occuring during this complex and dynamic process! This video show the surface of a Xenopus embryo surface during gastrulation. Early on, the dorsal lip of the blastopore forms due to the contraction of bottle cells (see below). The blastopore continues to develop from the early "frown" until it can be observed as a complete circular ring of involuting cells. 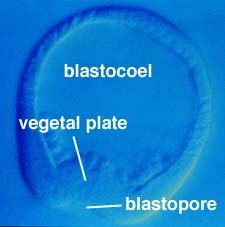 Convergent extension closes the blastopore at the yolk plug and elongates the embryo along the anterior--posterior axis. The posterior end of the embryo is pointed at you. 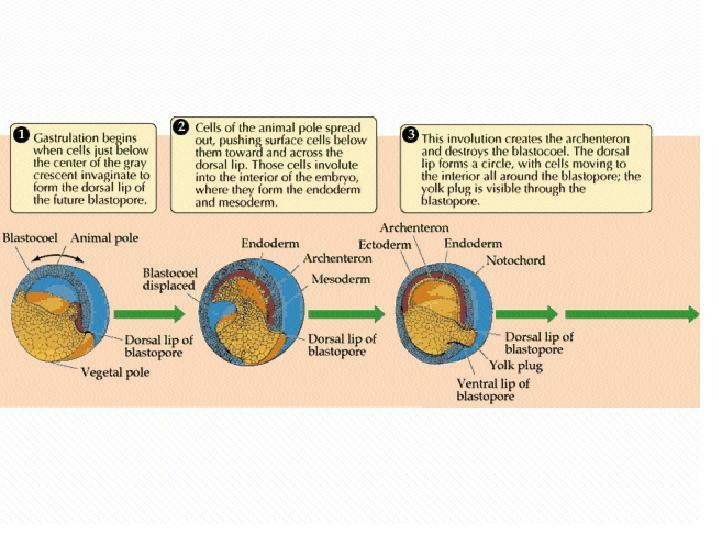 How does the the blastopore lip form? A small group of cells change shape, narrowing at the exterior edge of the blastula. This change in cell shape, called apical constriction, creates a local invagination, which pushes more interior cells upwards and begins to roll a sheet of cells towards the interior. The constricted cells are called bottle cells, due to their shape (like an upside down bottle in these images). During gastrulation in birds and mammals, epiblast cells converge at the midline and ingress at the primitive streak. 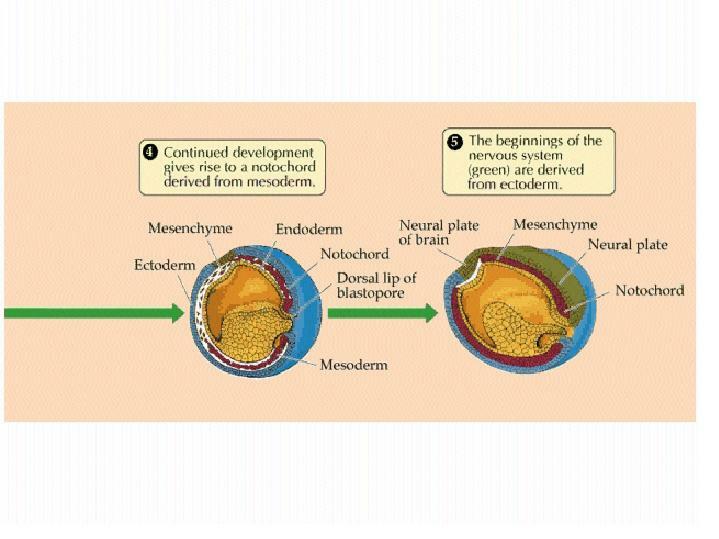 Ingression of these cells results in formation of the mesoderm and replacement of some of the hypoblast cells to produce the definitive endoderm. As gastrulation proceeds, the primitive groove extends anteriorly. A cross-section through the embryo allows us to observe the three germ layers that form during gastrulation: ectoderm, mesoderm, and endoderm. Show below are images of human embryos during gastrulation,13 - 19 days post ovulation. Notice the primitive streak, which is analogous to the blastopore of Xenopus.